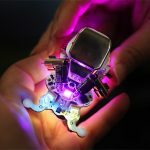 An insect microbot has become reality. Weighing just under 0.080g and less than 5.0 mm in size, this insect-inspired microbot has six legs and can mimic crawling motion of an ant. Dr. Saito and his colleges at Nihon University have actively sought out ways to integrate artificial neural networks to generate smooth, insect-like locomotive (switching) behavior. Before we dive into further details, we will first define what biologically inspired technology is. “The term biomimetic, which was coined by Otto H Schmitt (Schmitt 1969), represents the studies and imitation of nature’s methods, mechanisms and processes. Nature’s capabilities are far superior in many areas to human capabilities, and adapting many of its features and characteristics can significantly improve our technology.” – Bar-Cohen, 2006. The field of biomimetics offers tremendous potential for future technologies. In this research, a microbot was developed at the microscale by taking inspiration from the biophysical mechanisms of insects: an ant to be specific. 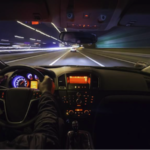 Researchers used analog integrated circuit (IC) to construct artificial neural networks, which generates the “driving waveform” or pulse that drives the locomotion of the microbot. To actually enable any robot to walk, crawl, swing, or even jump, there needs be an actuator. An actuator is the actual mechanism that enables the execution of an action in robots, which is analogous to the function of muscles in living organisms. 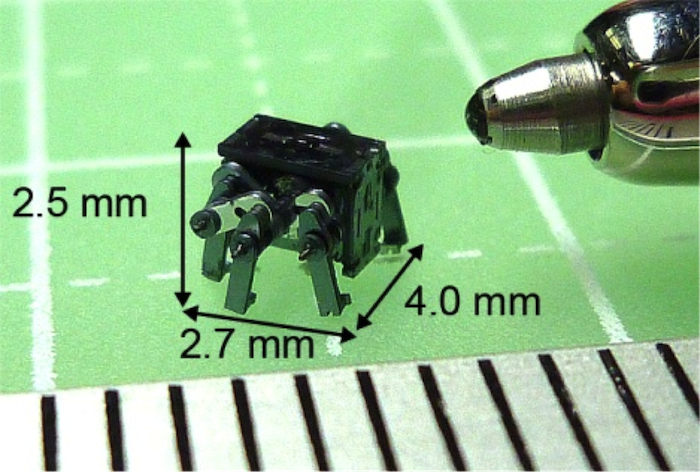 This ant-like microbot was built using rotary actuators with embedded shape memory alloy. Both the actuators and the artificial neural networks were constructed with silicon wafer and later integrated by using micro-electromechanical system (MEMS) microfabrication. As shown in Figure 1, the link mechanism consists of 3 legs, shafts and link bars. The middle legs and the rotors have the same rotational phases due to the middle legs affixed to the rotor. The front legs and the rear legs are affixed to the middle legs by link bars and this enables 90° phase shifts. The microbot measures 4.0 x 2.7 x 2.5mm and is connected to eight signal wires and two GND wires (Figure 1b). 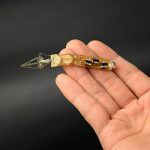 This tiny robot can crawl when the signal wires are connected to the artificial neural networks. 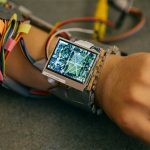 Something special about this MEMS robot is that it implements the large-scale artificial neural networks constructed by hardware models, instead of software models. According to the researchers, the large-scale mathematical (software) neuron modeling is very difficult given the limit to computer performance, such as the processing speed and memory capacity. On the other hand, the hardware neuron modeling allows continuous processing of neural network and nonlinear operations at high speed. Together with IC technology, hardware models can help reduce the circuit scale. So, it’s very useful when it comes to micro- and milli-scale projects. For this reason, they opted for the hardware neuron model. Why is neural network so important? 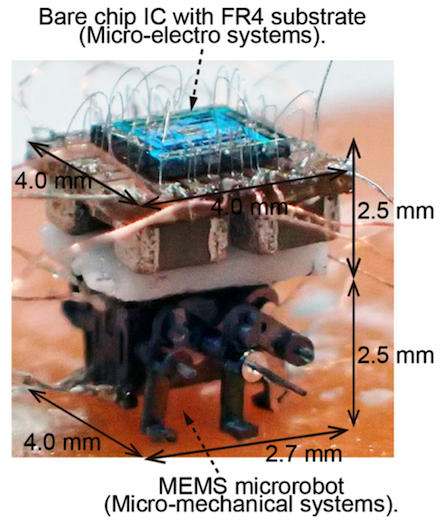 Why did researchers try so hard to incorporate this system into this microbot? Neural networks are important because they are essential to a control system that is “adaptable”. In other words, the neural network enables a robot to respond and react to certain events in a given situation so its movements are not automatic. At some point, learning occurs and a robot can make decisions based on information gathered. 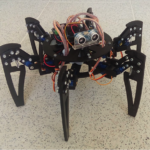 Taking full advantage of a pulse-type hardware neuron model, this milli-scale robot can crawl like an ant. The pulse-type hardware neuron model is a class II neuron model, which shares the same features as a real biological neuron such as threshold, refractory period, and spatio-temporal summation. In addition, the model allows the generation of continuous action potentials. The hardware neuron model outputs the “driving pulses” and these pulses operate the artificial muscle wires of the robot. It’s interesting to note that the robot control was achieved through continuous pulse waves, similar to the pulses delivered to biological neurons, without any software programs or A/D converters. As shown in Figure 2, the hardware neuron model can output the waveform of both forward movement and backward movements. Output signals from the waveform are connected to the artificial muscle wires made of copper wires. On top of the micro-mechanical system (bottom), which weighs 0.02 g, is the bare chip IC of artificial neural network micro-electro system (top). The bare chip IC is fixed to the flame retardant 4 (FR-4). The speed of locomotion of the MEMS microbot is 4 mm/min. It can speed up to 26.4 mm/min without the bare chip IC with FR-4 on the top. One thing to note here is a current mirror circuit. The shape memory alloy actuators require an electrical current to generate the rotational movements. Therefore, the voltage waveform had to be converted into the current waveform. As seen in the video, this insect-inspired MEMS microbot has a locomotive behavior that is similar to that of an ant. Don’t be too surprised by the slow speed! Researchers explain that the speed is relatively slow due to the heat of the shape memory alloy conducting to the mechanical parts of the MEMS microbot. A new type of rotary actuator that can generate continuous rotational movements with faster speed is introduced in their subsequent publication. If you have any comments or questions, please leave them for us at Google +. 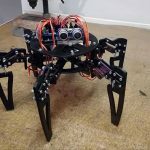 Follow us there; In the next article we will explore miniaturized hexapod MEMS microbots with two kinds of actuators: shape memory alloy (SMA) actuator and piezoelectric (PZT) actuator.